As a teenager growing up in the early Nineties there was no escape from Take That. Love them or loathe them, everyone knew Gary, Robbie, Mark, Jason and Howard. These boys were everywhere – seemingly on all four TV channels and pervading every radio station of their day. Marketed on everything from posters to pencil cases, Take That’s profile was immense and eventually became a defining element of Nineties’ culture. Newspapers even compared their success to The Beatles. Some 25 years later, there now comes a musical in their honour, forged from their chart-topping hits. America gave us New Kids on the Block. In response, Manchester delivered Take That and a debut of camp, high energy dance numbers. Whilst their style and routines could be considered almost laughable by today’s polished standards, there is no doubt that singer-songwriter Gary Barlow offered Take That a higher level of musical craftsmanship which exceeded the expectations of a manufactured boy band. His music was well written and radio-friendly, landing hits with Pray and A Million Love Songs, to secure lasting success. Barlow’s music forms the basis of The Band, orchestrated with a scale and urgency by Steve Parry. Whilst a Nineties pop musical may not be to everyone’s taste, Barlow’s writing is brilliantly showcased in this production and certainly makes an impact. Patience is a bravura sweeping number, whilst Back For Good and Shine lend themselves surprisingly well to the musical theatre medium. Covers of Relight My Fire and Could it Be Magic translate less effectively, but are nevertheless entertaining and fun. Jayne McKenna, Rachel Lumberg, Emily Joyce and Alison Fitzjohn with Five To Five in The Band. Credit: Matt Crockett. Take That’s boots are filled by Let It Shine winners Five to Five, who do an admirable job of mirroring the essence of the original line-up. The boys are often present onstage and always in the mind’s eye of the characters, which gives the sitcom scenes a haunted quality. Whilst some dance is a little bit loose, Five to Five consistently deliver a strong, live vocal accompaniment with some rigorous choreography. Tim Firth’s lightly touching and funny script is well served by a charismatic company. Emily Joyce and Jayne McKenna inject some real heart into their characters whilst Rachel Lumber and Alison Fitzjohn arguably get the best one-liners, delivered with a cocksure charm. The whole ensemble is strong and the delivery is punchy, ensuring the show rarely slows down between its big musical numbers. 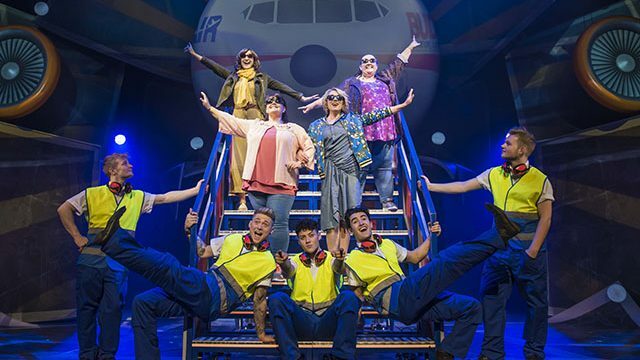 Kim Gavin and Jack Ryder’s direction presents some ingeniously choreographed visuals, including a budget airline departure sequence and an innovative gag aboard a bus, which both climax into impressive showstoppers. Jon Bausor’s design is a highlight of the production and is well-focused on period iconography; signposting long-forgotten artefacts like cassette tapes, or referencing culture such as Top of the Pops, Smash Hits and even Ceefax, which succeeds in sweeping up its audience in a wave of nostalgia. A love letter to the Nineties, The Band is an evocative backstage pass to the recent past which is easy-watching, musically upbeat, and often funny. A frothy bubble-gum musical that doesn’t take itself too seriously, The Band is an uplifting retrospective for 30-somethings and their families, which is sure to delight those who grew up in that simpler time. Cast: Rachel Lumberg, Alison Fitzjohn, Emily Joyce, Jayne McKenna, AJ Bentley, Nick Carsberg, Curtis T Johns, Yazdan Qafouri, Sario Solomon. Directed by: Kim Gavin & Jack Ryder Written by: Tim Firth Theatre: Leeds Grand Theatre Duration: 150 minutes. Dates: Tuesday 20th – Saturday 31st March 2018. Strong musical arrangement and performances.